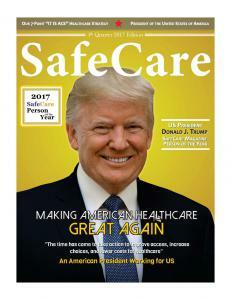 LEXINGTON, KENTUCKY, USA, December 26, 2017 /EINPresswire.com/ -- SafeCare Magazine announced today that US President Donald J. trump was awarded its 2017 Person of the Year https://www.safecaremagazine.com/. For the third year in a row, this recognition selected the one individual who contributed significantly toward improving the access, cost, and quality of healthcare across the globe. The cover line reads, "Making American Healthcare Great Again: An American President working for US" and the cover image features the official portrait photograph of the President of the United States. 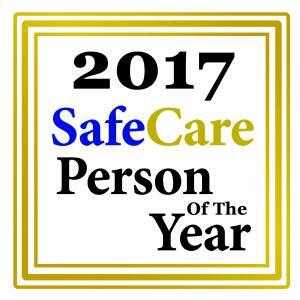 The shortlist of candidates for SafeCare’s 2017 Person of the Year also included: His Highness Sheikh Mohammed bin Rashid Al Maktoum, Ruler of Dubai – United Arab Emirates; Engineer Sobhi Batterjee, CEO, Saudi German Hospitals Group – Saudi Arabia; Mr. Hector Slim Seade, Director General, Telmex, Mexico; Lord James O‘Neill, former British Treasury Minister - England; Dr. Patrick Soon-Shiong, CEO, NantHealth – USA; His Excellency Tawfik Khoja, General Secretary, Arab Hospitals Federation – Saudi Arabia; Former President Michelle Bachelet, the Republic of Chile; Former Astronaut Dr. James Bagian - USA; Honorable Jeremy Hunt, British Secretary of Health – England. SafeCare magazine thanks our numerous readers and healthcare leaders who supported the nomination of President Trump. The SafeCare Group thanks President Trump for working to Make American Healthcare Great Again. SafeCare Magazine is a private venture delivering information on the people, ideas and novel technologies affecting access, cost, and quality of healthcare across the globe since 2015. SafeCare® Magazine, SafeCare Analytics®, and 100 SafeCare Hospitals® comprise The SafeCare Group®, a privately held company with the motto Softwaring Healthcare Excellence®. For more information about SafeCare magazine, visit www.safecaremagazine.com. The SafeCare Group was founded in 2010 and is a privately held company with the motto Softwaring Healthcare Excellence®. The SafeCare Group software solutions enable hospitals to take advantage of disruptive healthcare technologies that optimize hospital reimbursement and accreditation. Since 2012, SafeCare Analytics® have been helping hospitals excel with physician privileging software for Joint Commission OPPE, and hospital software for better readmissions, cost, complications and infections. Since 2013, 100 SafeCare Hospitals® listings have been Recognizing Healthcare Excellence® of 100 US hospitals that excelled with low infections, readmissions, and complications. For more information about The SafeCare Group, visit www.safecaregroup.com.